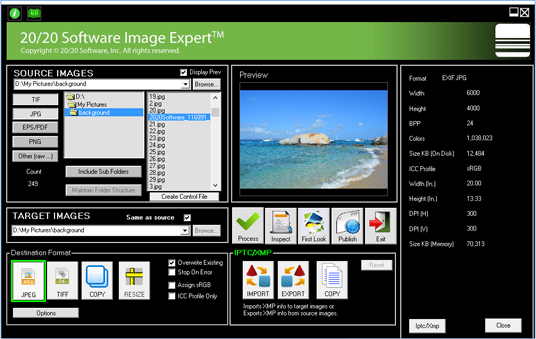 20/20 Software is pleased to announce the stand-alone release of Image Expert, an advanced tool for image workflow, analysis, and processing. Image Expert has been an integrated part of 20/20's suite of Media Management software. Now, we are making this powerful program available to libraries, photographers, and others who don't use our complete system. With Image Expert, you can test images against a set of acceptance rules, send reports to image suppliers, convert images between multiple formats, tag images, import and export IPTC/XMP metadata, rename images using renaming rules, and send images via simple copy or FTP. Image Expert gives you all the tools you need to prepare images for online commerce. Image Expert is a MUST for picture libraries, museums, institutional photographic departments, and photographers! "The Image Expert is a great tool for our digital workflow needs. Being able to import/export metadata and rename image files is integral, and the Image Expert makes it fast and easy. Thanks 20/20!" "Image Expert provides something that I have long been searching for – a simple way to extract metadata from a batch of image files, edit, and replace the metadata specific for each image, including individual image reference numbers. The process is now completely streamlined and can be done in a matter of minutes rather than days - what a timesaver! An additional function that I find very handy is the ability to instantly extract a list of images in a folder into a spread sheet." "Image Expert has quickly become our go-to for metadata ingestion and resizing large batches of images. In the past we were using multiple programs to achieve what the Image Expert does through one clearly laid out interface. Thanks to David and the rest of the team at 20/20 for streamlining our workflow and saving us time in the process." "We find that Image Expert is useful for the tasks that no other software we have will do. We often have the task of reducing the size of archival TIFFs and changing the file names. PhotoShop can reduce the size, but we have always had to rename manually. Now, with Image Expert, we can do both in one simple, quick process â€“ and can do the whole process in a matter of minutes. It will save us a huge amount of time. Thanks David!" "I'd been using four different software applications to accomplish what I now do with Image Expert in one fell swoop. The ability to automate the processing of large batches of images from start to finish with one program is a huge time saver. Thanks, David!"